A decade or two ago, the idea of a home office would have been a touch alien to most homeowners. Not many could have carried their work home before the technological revolution and new-age gadgets changed the world forever. But the home office is almost a ‘must have’ in contemporary homes, and designers are finding innovative solutions such as the tiny corner in the bedroom to add a workspace even in the smallest of homes! 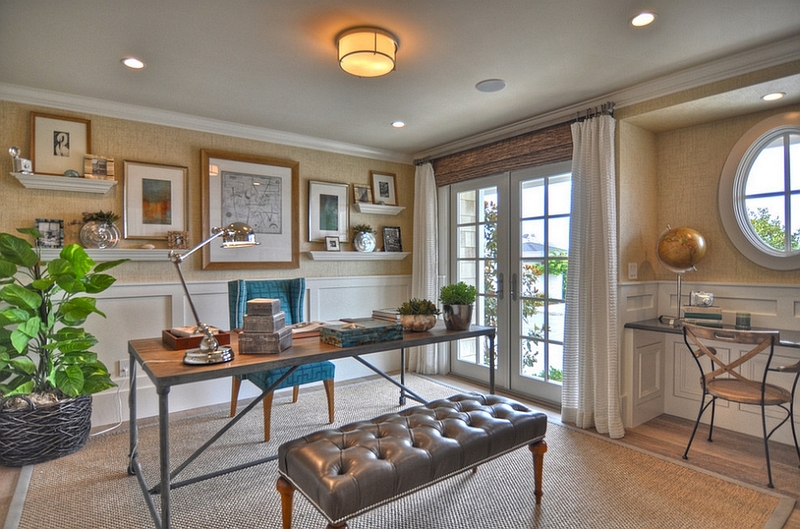 Today we take a look at 10 fabulous beach-style home offices that have a breezy, elegant vibe. The beach style is perfect for those who prefer a less formal, more relaxed and cheerful work atmosphere. Such spaces not only increase productivity, but the laid-back aura of the style also sets the stage for a more creative and fun work environment. It definitely beats the boring cubicle with simple straight lines and bland hues! When we think of beach style, we imagine a setting that captures the aura of sun, sand and surf indoors. 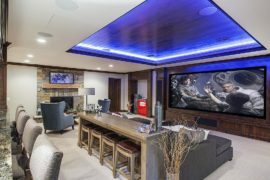 This dramatic home office goes a step further and seems to bring the ocean indoors, thanks to its unique design and the perfect vantage point that the house enjoys. 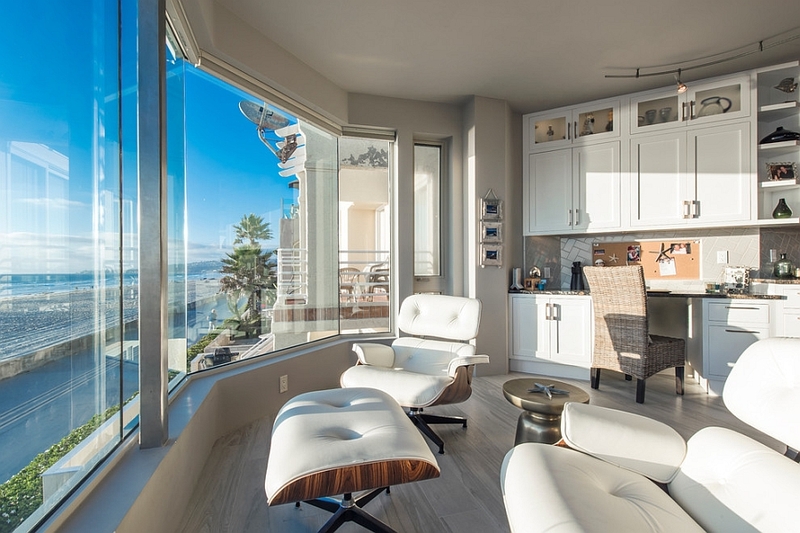 Part of a luxurious beach condo in San Diego, California, the sight of the mighty pacific right outside the window and the luxurious decor enhance the beach style of the home office. 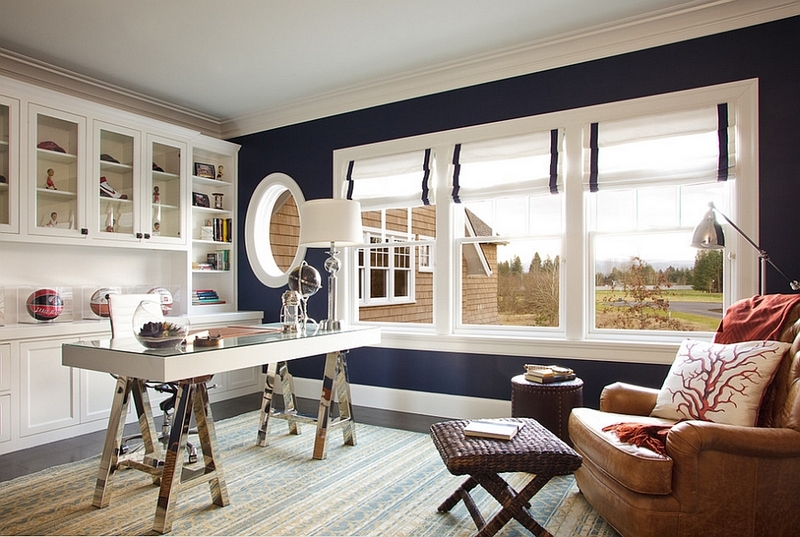 Bold navy blue is one of the hot colors this winter, and using it in a beach-style home office is one of the easiest ways to add it to your home. 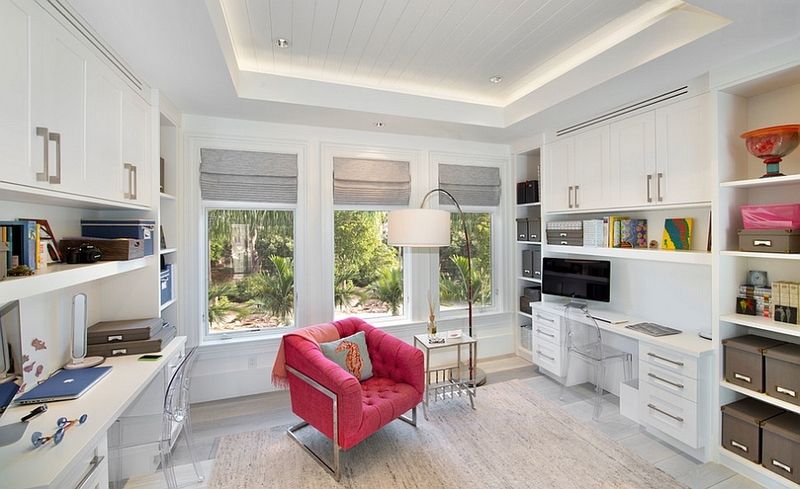 Inspired by a nautical a color palette, this home office blends a touch of contemporary flair with the classic beach-style design. The view outside might not be as amazing as in the case of the home office above, but the unique windows and the apt Roman shades more than make up for it. 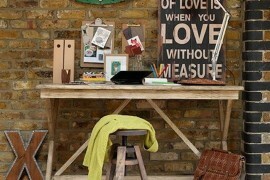 We love this simple home office, as it is crafted out of a unique nook that might have otherwise been left unattended. 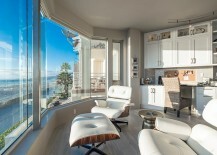 Its design is simple, and yet the view of the ocean in the distance stands out prominently. The view is not too distracting, and the pleasant use of light blue and white turns the space into an absolute delight. Ample storage options and natural ventilation cap off this ergonomic home office. 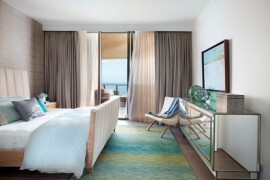 White and blue are indeed the two most prominent colors of the beach style. But you can give this color palette and the design style itself a modern makeover by infusing more contemporary details and decor. This elegant home office, study and craft zone makes perfect use of space with a shelf that offers both storage and a wonderful display. Vases, furnishings and a lighting fixture with a touch of light blue enhance the beach style while giving it an exclusive aura of its own. 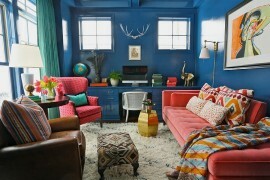 Here is another home office that seems to find that perfect balance between a modern vibe and the classic beach style. The ceiling adds another layer of intrigue to the room, while the acrylic Ghost Chair at the workstation seems to disappear into the backdrop! This home office comes with twin workstations along with a cozy reading chair in case you are bored with work and wish to catch up on your favorite page-turner! 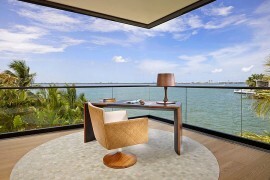 It is the exquisite use of black that makes this beach-style home office so special and exceptional. Black adds a touch of sophistication to the room and also anchors the space beautifully. 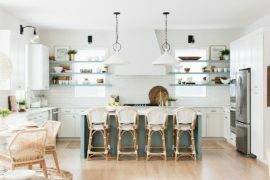 While it is generally not the color of choice in beach-style settings, it seems to work gorgeously here and infuses an air of modernity with ease. The glossy table surfaces along with other lustrous surfaces also make the small home office seem a lot more airy and spacious. 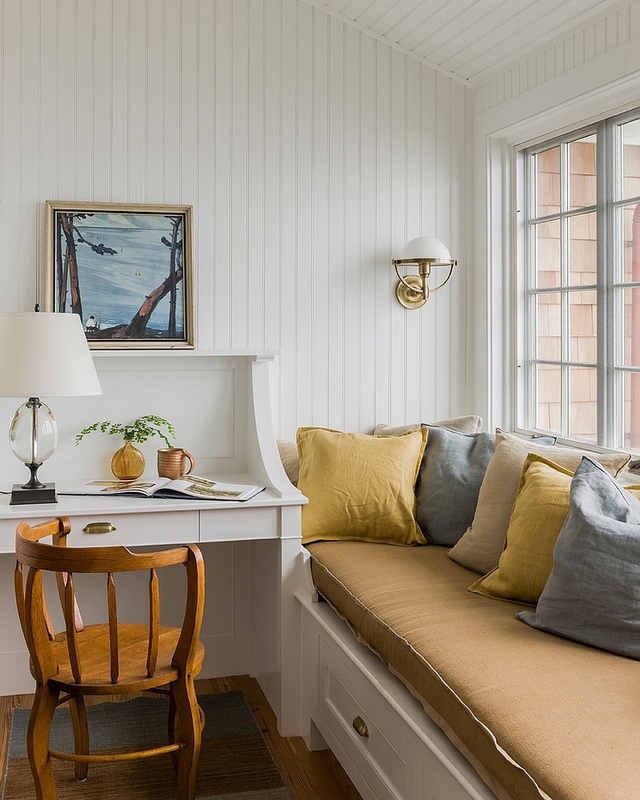 If you are longing for those sunny, warm summer days as you brave the cold winter chill, the beach-style home office is indeed perfect for you. And the one below even comes with a cool window seat that allows you to tuck in with a hot cup of coffee and maybe indulge in some festive shopping on your iPad (or whatever works for you)! 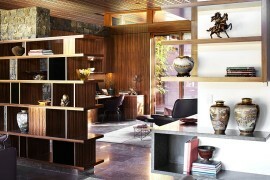 It’s elegant, informal and definitely will encourage you to spend a lot more time in the home office. 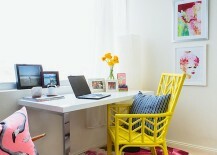 There is no doubt that the sunny chair in yellow is the showstopper in this small home office. 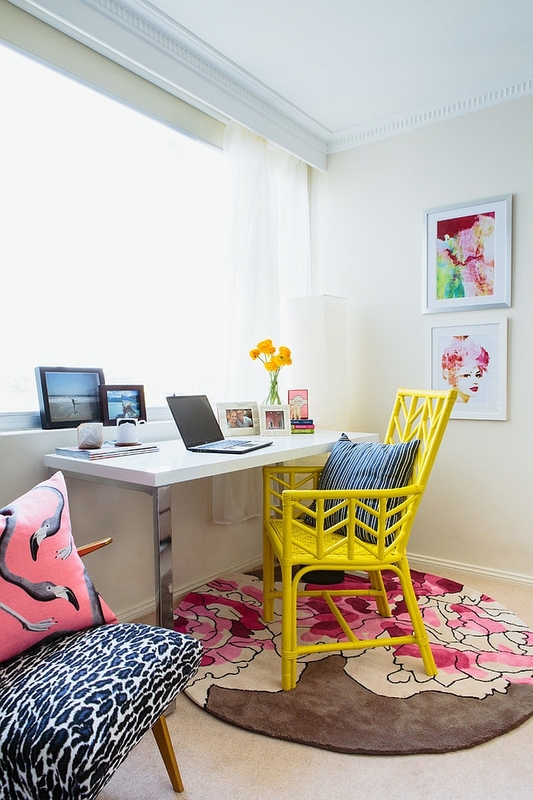 This is another perfect example of how even a small nook can be turned into a delightful workspace without any fuss. Chic and glamorous to its core, this tiny space charms with its feminine vibe, refreshing splashes of bright color and a hint of glitter. Not all beaches are pristine white, and similarly, you need not adhere strictly to a white backdrop for a beach-style home office. The use of grasscloth wallcovering not only mimics the color of a golden-brown beach, but it also seems to bring in a similar texture to the room. A hint of natural greenery and eclectic decor complete the lovely setting.